Emily Hoffmann isn’t your everyday equestrian. Yes, her horses live in a barn in her backyard, and she’s ridden competitively for years. 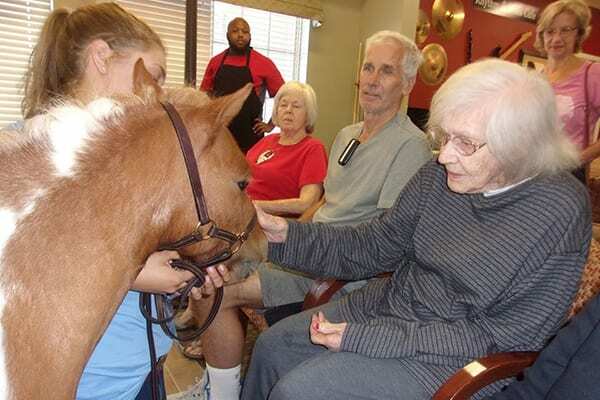 But these days, her miniature horse, AppleJack, clip-clops his way though the halls of hospitals, schools, hospice centers and nursing homes offering the healing benefits of animal and human interaction. Hoffmann, a sophomore majoring in physical therapy, began her vocation about three years ago after her sister, Anna, was diagnosed with Ehlers-Danlos Syndrome (EDS) at the age of 10. A seemingly invisible condition, this rare, inherited disorder affects a person’s connective tissues, primarily the skin, joints and blood vessel walls, rendering them weak and elastic. Anna has EDS type 3 hypermobility, which causes her joints to be over-flexible and come out of place easily. With the onset of EDS, Anna experienced limited activity, says Hoffman. Between multiple surgeries and physical therapy sessions, Anna found happiness and peace spending time with horses. The positive interaction between horse and human gave the sisters an idea, and they started reading about animal and human therapy, which led them to miniature horses. Standing about three feet tall and smaller than a pony, miniature therapy horses perform the same duties as therapy dogs. They are calm, gentle, sympathetic and much smaller than the standard horse, weighing in at 200 to 300 pounds on average as compared with a normal horse, which can weigh 1,200 pounds. 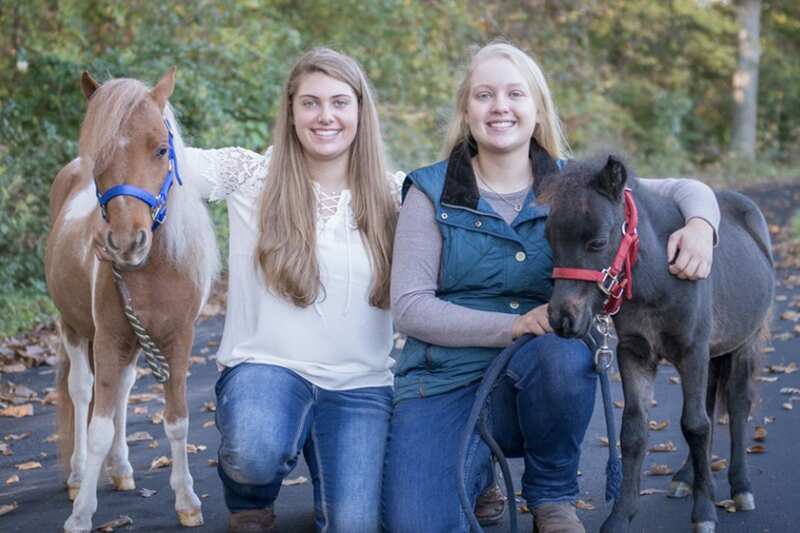 The sisters searched for a miniature horse that could be trainable as a therapy horse. They found a child-friendly, miniature pinto colt named AppleJack.“We picked up four-month-old AppleJack and brought him home in the back of our car,” Hoffman says. After eight months of training and passing a series of tests, AppleJack was registered as a therapy horse with Pet Partners, a national nonprofit that registers nine different species for therapy animal work. With AppleJack ready to serve, the Hoffman sisters established AppleJack Therapy Foundation in 2015. 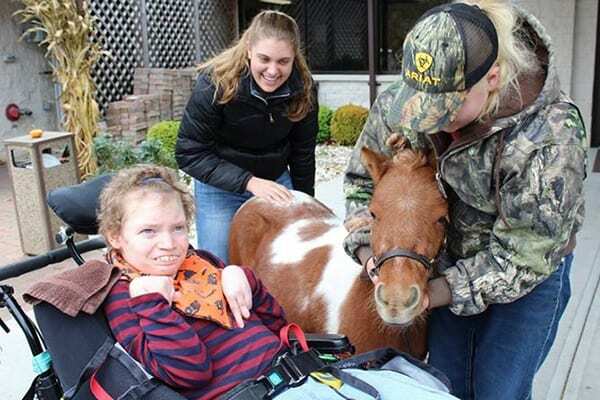 The nonprofit organization provides miniature equine therapy while raising awareness of EDS. They later bought a second horse, a black miniature named LuckyCharm, which is also registered with Pet Partners. Hoffmann and her sister operate AppleJack Therapy out of their family’s home in St. Charles County, Missouri. They have a barn and pasture, four large horses, six chickens, three cats, two dogs and their two miniature horses. The Hoffmann sisters and AppleJack make numerous public appearances throughout the year raising awareness of their organization and work. Since AppleJack Therapy is a nonprofit foundation, it relies on public donations and gifts so that all visits are cost free. Tax-deductible contributions are used for the care and transportation of AppleJack and LuckyCharm, and the continual research and awareness of Ehlers-Danlos Syndrome. Even with the task of running a nonprofit, Hoffman manages being a full-time student in Maryville’s rigorous physical therapy program, having a part-time job as a physical therapy technician and reserving one day a week for miniature therapy visits. Despite her busy schedule, Hoffman says making someone’s day is worth all the effort. This story originally appeared in the Fall 2018 issue of Maryville Magazine.